A giant pile of royal blue velvet - soon to become lots of Aislinn dresses! Remember we have a coupon through June for 18% off - "MAY221998" to celebrate 18 years of business. Enjoy! 18 years ago today, my fashion label was born. It also happens to be my birthday. :) I'm only 19 in this picture and that Liseron skirt was my first creation. Use discount code MAY221998 for 18% off everything in my shop now through June! A sneak peak at my new winter line...this one is in white, but inspired by my (very black) Angelique dress. 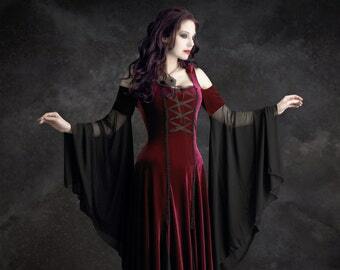 The sleeves are soooo long and lovely! The front is laced with organza ribbon; the back has corset-style lacing, too. I cannot wait to wear this!